Marshall High School, in conjunction with Marshall Public Schools, Murrell Library of Missouri Valley College, and the Marshall Public Library, is pleased to host author Sam Weller. Mr. Weller is a two-time Bram Stoker Award winner who has the distinction of being Ray Bradbury’s authorized biographer. Mr. Weller has authored three books on Bradbury: The Bradbury Chronicles: The Life of Ray Bradbury, Listen to the Echoes: The Ray Bradbury Interviews, Ray Bradbury: The Last Interview and co-edited Shadow Show: All New Stories in Celebration of Ray Bradbury. Mr. Weller’s essay have appeared in the Paris Review, All Things Considered, Slate, and many others. He is a frequent blog contributor for the Huffington Post. Mr. Weller is an Associate Professor of Creative Writing at Columbia College Chicago. Additionally, he travels the globe, speaking about Bradbury at colleges and libraries across the world. Mr. Weller will be joining Marshall High School on November 17th, at which point he will deliver a lecture on Ray Bradbury to English I and II students. 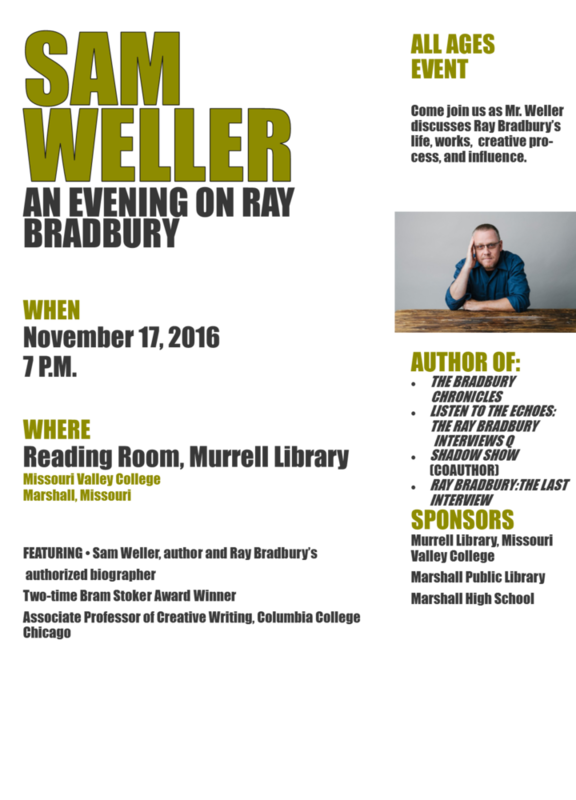 On the evening of the 17th, Murrell Library will play host as Mr. Weller speaks about Bradbury and his experiences with him. The presentation is open to the community and will be held in the Reading Room at Murrell Library at 7 P.M. Mr. Weller will return to Marshall High School the next day to work with English I students on Bradbury’s creative process and assist them in creating their own piece of fiction. Marshall High School would like to thank Murrell Library and the Marshall Public Library for their support in bringing Mr. Weller to Marshall. We are beyond thrilled to offer this opportunity to our students and the community. If you have any questions regarding this impending visit, please email Amanda Van Winkle at avanwinkle@marshallschools.com or call 660-886-2244.